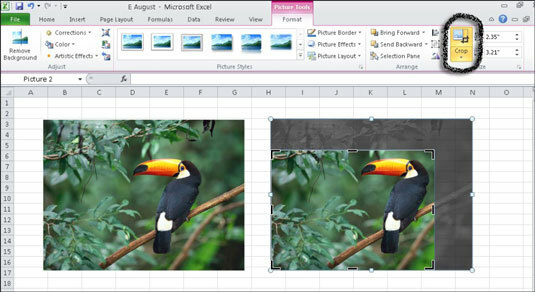 Excel 2010 provides many tools that let you manipulate graphic objects in your worksheets. You can delete, move, resize, rotate, flip, and crop objects, for example. Cropping an image or picture allows you to remove unwanted portions of the picture. Select the object you want to modify by clicking it. Selection handles appear around the object. Delete: Press the Delete key on the keyboard. Move: Position the mouse pointer over the object, but not on the handles. Click and drag the object to the desired location. Optionally, nudge a selected object using the up, down, left, or right arrow keys. To move a text box, position the cursor on one of the edges, between two selection handles. Resize: To resize an object, position the mouse pointer over one of the white selection handles and drag the handle until the object reaches the desired size. Use the top or bottom middle handles to resize the object height. Use the middle left or right handles to resize the object width. Use a corner handle to resize both the height and width. If you want to maintain proportions when resizing an object, hold down the Shift key. Rotate Shape: Position the mouse pointer over the green rotation handle until the pointer turns into a circle. Then, drag the green rotation handle until the object rotates to the desired angle. 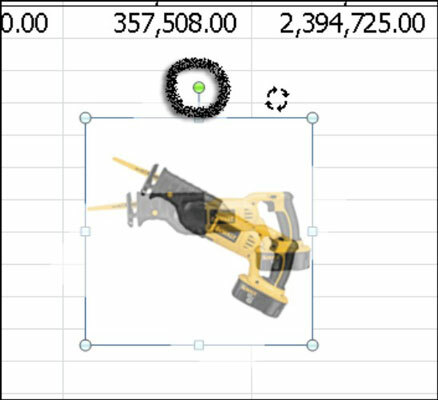 Use the rotation handle to rotate shapes or other objects. On the Picture Tools Format tab, click the Crop button in the Size group on the far right. Position the mouse pointer over one of the crop handles that surround the image. Click and drag a crop handle inward to crop out an area of the image. You can crop an image to remove undesired areas of a picture. Continue cropping other edges of the image, as needed. Click the Crop button again to turn off the Crop tool. Cropping a picture is a delicate process that can easily go too far. If you accidentally crop out too much of the picture, pressing Ctrl+Z will quickly undo your last cut. On the Picture Tools Format tab, click the Rotate button in the Arrange group. A menu of choices appears. 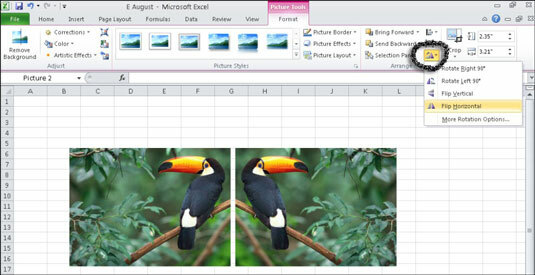 As you pause your mouse over a menu option, Excel previews the effect on the picture. An image before and after flipping the object horizontally. Choose More Rotation Options to display the Format Picture dialog box, where you can set many options precisely, including size, rotation, and cropping.